Hundreds of Eisa troups will demonstrate their skills this Sunday in the finale to Eisa week in downtown Naha. 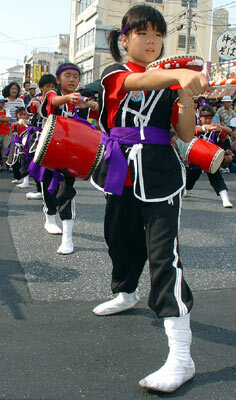 Ten thousand drummers and dancers will parade along Kokusai Dori¹s length starting at three o¹clock. The annual parade is expected to run four hours. 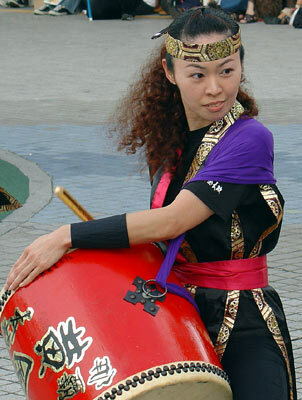 Eisa, a traditional Okianwan dance featuring taiko drums, is extremely popular everywhere on the island. It is a mainstay during Obon, a Buddhist holiday which honors the spirits of ancestors. Eisa week began last Sunday, when a half-dozen dance troups performed at Palette Kumoji on the southern end of Kokusai Dori. Various smaller Eisa demonstrations and exhibitions have been taking place throughout the week. Eisa Ashibinaa is the final evening of show performances, with groups performing at three separate downtown locations. Performances run from 7:00 to 8:30pm. There will be action at Palette Kumoji Plaza, in the mini park in front of Naha Tembus Hall on Kokusai Dori, and in front of Okinawa Prefecture Hall. All performances are free. A big pre-parade fills the streets Saturday afternoon from 2~5pm, as Eisa dancing begins in front of Palette Kumoji, then moves on into the park in front of the Prefecture Hall at Citizens¹ Park for a second round of musical fun from 6:00 to 8:30pm. What¹s even better? There¹s more Eisa across the islands, and it¹s all free. The eastern suburban community of Yonabaru hosts its own festivities, including Eisa and a tug-of-war. There¹s also the Miyako Island Summer Festival 2006 on Friday and Saturday. Festivities begin at 6pm at the Ichiba Dori on Miyako Island, in Hirara City. To Naha, travel south on Highway 58. The first opportunity in Naha to turn left to Kokusai comes shortly after passing Tomari Port//Tomarine Hotel. At the next intersection, turn left at the Roynet Hotel traffic signal. Kokusai is about one-half kilometer away. Three other left turns can be made at Matsuyama Crossing, Kumoji Intersection and Izumizaki. All are marked. Be assured traffic will be heavy, and we recommend parking farther from Kokusai Street itself and walking to the festival areas. To Yonabaru, which is east of Naha City, travel highway 330 or 331 and look for the street signs. Once in the city, there are signs directing festival goers to the parking areas.